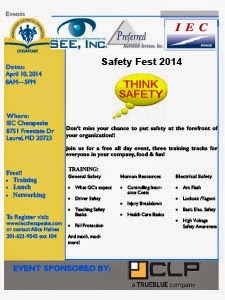 Don’t miss your chance to put safety at the forefront of your organization!! There will be three training tracks for everyone in your company, food & fun! Also at the IEC facility, "Strengths of LED" with Jeff Dross, Kichler Lighting. LED saves energy, is small in size and color can be selected/determined. LED does not need to be the only product selected to light our environment, it just needs to be the right light for the specific job. This class will teach you how to successfully determine if LED is the right solution for the lighting job. April 15, 2014. 11am-1pm. Contact Alice Haines 301-621-9545 ext 104 to sign up. and a few more events!